The term Walz comes from the old German word "Waltzen" - to roll, turn or glide. 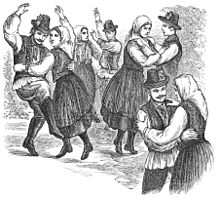 The Weller or turning movements were danced by peasants in Austria and Bavaria as early as the 17 Century and much of the familiar lilt of the waltz can be traced back to simple peasant yodelling and dancing. 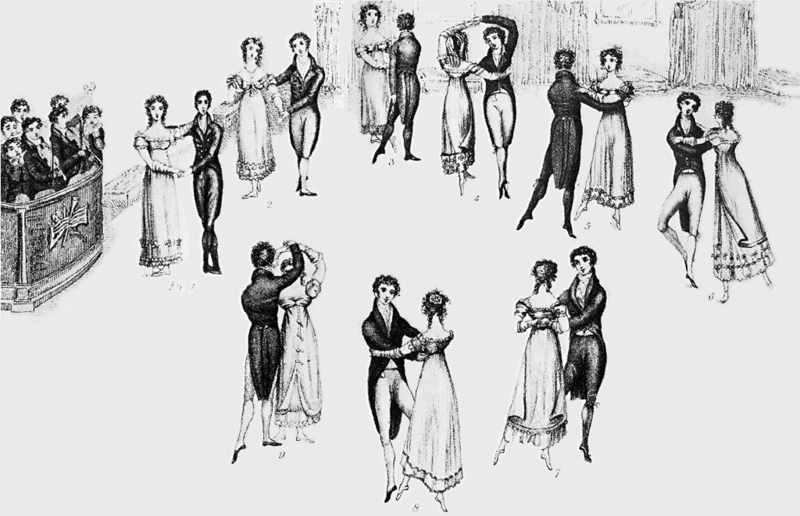 During the middle of the 18 Century the Allemande form of the Waltz was very popular in French high society. Originally danced as one of the figures in the contradanse, with arms intertwining at shoulder height, it soon became an independent dance and the "close hold" was introduced. The waltz became very popular across Europe with increased interest due to the two great Austrian composers Franz Lanner and Johan Strauss. They set the standard for the Viennese Waltz - a faster version of the standard Waltz. The following is an extract from the movie "Sissie" 1955 staring Romy Scneider - an example of the court Viennese. "We who go forth of nights and see without the slightest discomposure our sister and our wife seized on by a strange man and subjected to violent embraces and canterings round a small-sized apartment - the only apparent excuse for such treatment being that is done to the sound of music - can scarcely realize the horror which greeted the introduction of this wicked dance." What made the Waltz acceptable was the love of it by Queen Victoria and Albert, when they danced it in Court circles. The Waltz was now firmly established, travelled across to America, when a few variations were added, and became a standard ballroom dance. 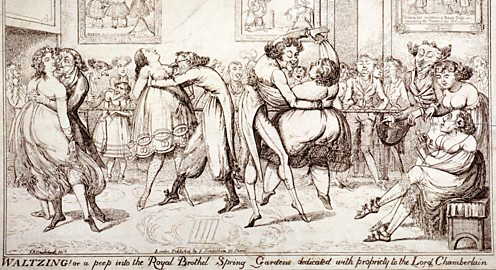 Its popularity waned at the start of the 20 Century when new dances were created, mainly in America. Indeed the Foxtrot became all the rage and the Waltz almost disappeared but after the 2nd World War it regained its popularity and today is danced in two accepted firms - The Modern Waltz and the Viennese Waltz. Professional dancers Mirko and Alessia. Notice the gliding movements and rise and fall of the feet.